Paris (AFP) – The Armitage brothers scored three tries between them as Toulon sealed a 25-9 bonus-point victory at Pau to give their hopes of retaining the Top 14 title a boost on Saturday, before leaders Clermont saw off Agen 38-10. Six-try Clermont stretched their advantage at the top of the table to eight points as they also picked up a bonus point, although both Montpellier and Racing 92 can cut the gap when they play on Sunday. In a tight first half two Eric Escande penalties pulled Toulon into an early lead, but the hosts hit back with a successful kick from Colin Slade, and six points from the boot of Damien Traille gave Pau a three-point half-time advantage. Delon Armitage crossed shortly after the interval though with Escande adding the extras, and the English full-back burst through a gap to put the visitors out in front. Bernard Laporte’s men sealed an extra point when Steffon Armitage drove over, with Jonathan Pelissie completing the simplest of conversions. Toulon were back in domestic action for the first time in a fortnight since suffering just a second home league defeat of the season in a thriller with Clermont. The three-try win moves Toulon up into second place in the table. “In the first half it was not logical to be losing, we were just not disciplined enough,” Toulon coach Laporte said. Their bid for a fourth successive European Cup came to an end last Sunday with defeat to Racing 92, but they started strongly against Pau at the Stade du Hameau and were rewarded for some early pressure by Escande’s early kicks. The vulnerabilities that have been on show in recent weeks resurfaced again though and Pau regained a foothold in the game through New Zealand international Slade. Traille’s brace of penalties put the defending champions under pressure, but Delon Armitage eased any away nerves by scoring the first try of the game. After scrum-half Escande saw his score ruled out by the television official for a forward pass, 32-year-old Delon Armitage effectively ended the game as a contest with his eighth try of the season. Toulon continued to go in search of a bonus point, and it arrived in the 82nd minute when a turnover led to a five-metre scrum, which flanker Steffon Armitage took full advantage of by burrowing over. Clermont, who have made a habit of narrowly missing out on big titles, now look all but certain to be in the top four again come the end of the campaign. Unsurprisingly, they thrashed bottom club Agen, who remain without a single league win on the road all season. Alivereti Raka put them ahead after less than 15 minutes, and Australian Brock James converted. Fijian wing Raka powered over for a second try before half-time, before Judicael Cancoriet’s score just a few minutes after the restart. Flanker Camille Gerondeau added a fourth try, as so one-sided was the match that Clermont did not even bother trying to kick penalties. Noa Nakaitaci ran in number five, although Antoine Miquel managed a try for the beleaguered visitors. The hosts had the final say though, as English winger David Strettle raced over in the corner. 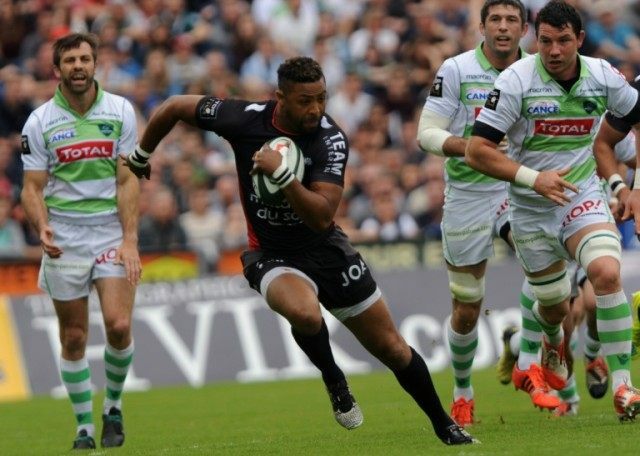 Elsewhere, Brive put four tries past relegation-destined Oyonnax in a 31-13 bonus-point win. Castres moved into the final play-off spot on Friday by winning a gripping match at Grenoble 33-28, leaving their opponents six points adrift of the top six.